Backup and restore system for unlimited computers with one key. Allow to provide billable technical services and customize UI. They can be installed on unlimited computers within one company. They can be used to provide billable technical services to inviduals and companies. AOMEI OneKey Recovery Customization also allow you to customize your UI and Logo. AOMEI Tech offers AOMEI OneKey Recovery software to computer manufacturers, enterprises, or individuals. If you’re a computer manufacturer or enterprise user, you may want to integrate or pre-install OneKey Recovery with your own products and distribute them to clients, please contact us to obtain certification of authorization and Pre-installation Edition of OneKey Recovery. The software can be customization by AOMEI’s UI Customization Tool, and AOMEI OneKey Recovery Technician Customization can be used for personal and commercial environment (Don't remove the copyright flag of AOMEI). So if you need to customize logo, GUI or rebrand on AOMEI OneKey Recovery software, you can directly use the "UI customization tool" of the software to complete. If you have any question, please contact with AOMEI via email to know more. Order process is secured by 256-bit SSL and 100% safe. License code will be immediately delivered to your email after purchase. Trusted by millions of users all around the world. They come from different countries and most give us highly-rated comments. 90-Day Unconditional Money Back Guarantee. If you are not satisfied with our product, you can ask us for money refund. 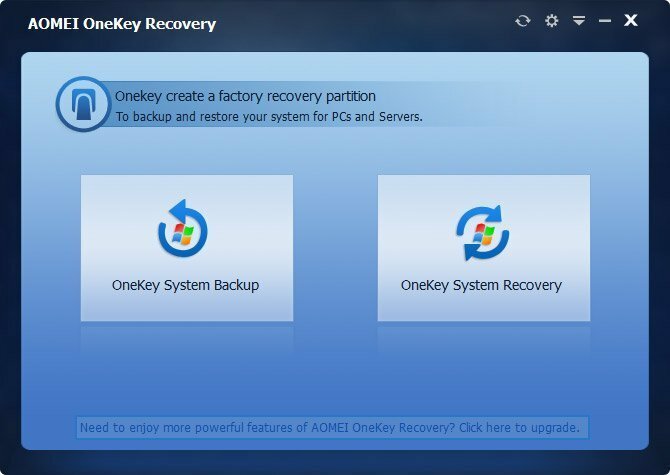 AOMEI?OneKey Recovery?is a free software that can help you to?create a factory recovery partition, make system backups, restore backups in case your system crashes.